Reporting, writing, and video by Jocelyn Ford. Photography by Yuyang Liu. Pastor Frank Haye was quietly nervous as he paced the lawn around the temporary stage at one of China’s biggest rock festivals. Haye wasn’t sure how the raucous audience at the Midi Music Festival, staged each May, would take to the soulful tunes of his Brooklyn Interdenominational Choir praising the Lord. That is, if anyone showed up at all. Black gospel music is virtually unknown in China, and the concert-goers had a choice of three stages in the expansive lakeside park, an hour outside the fabled garden city of Suzhou. Nevertheless, Haye was pleased he’d made it this far—the second stop on a five-city tour of China last spring. When the choir received the invitation to perform in China, Haye doubted the Chinese consulate in New York would issue visas to its 12 members. International performers are required to submit their set lists and lyrics to the Ministry of Culture prior to being granted entry. Since the Chinese Communist Party demands it be held in higher standing than religious figures, Haye worried songs about praising the Lord might be deal-breakers. This was the first of many surprises for the choir as it traversed China. Haye’s experience illuminates the contradictions and idiosyncrasies of the ongoing surge in spirituality in the nation of 1.4 billion people. Amidst fast-paced economic development, a new generation in China is seeking more from life than material pleasure alone, and some are turning to religion. Christian fellowships are growing fastest among all faiths, at about 7 percent a year. At this rate of expansion, in a few years China’s estimated 70 million Christians will outnumber members of the Communist Party, whose 90 million head count grew by just over 1 percent in 2015. That’s a concern for the nation’s top leadership. A draft religion law proposes new restrictions, including a ban on online religious services and overseas trips for religious training. Proselytizing outside of churches is already banned. The music promoter who invited the Brooklyn choir to China says he was not out to convert new believers. He just liked the music. The tour’s unlikely origins trace back to Cairo in 2014. There, at the Samaa International Festival for Spiritual Music and Chanting, designed to introduce audiences to religious heritage of diverse cultures, a long-haired, boyish-looking Chinese electronic music drummer named Liu Wei was enraptured by the gospel choir’s performance. “I really like this feeling. It’s like energy. It’s so warm,” said Liu, who prefers to be called Mico. His straggly hair tumbling out from under a knit cap, Mico asserted the Brooklyn Interdenominational Choir’s music has nothing to do with promoting faith. He likened proselytizing to duplicitous commercial pyramid schemes that have swept China in recent years. But Mico was also mindful of the risks he faced in trying to introduce a new genre rooted in Christianity. For most of the Brooklyn choir members, this was their first trip to a country led by a party that calls itself “communist”—a word that weighed heavily. Haye said his wariness came from the images of China he’d seen on TV. “I thought of communism, I thought of people being deprived or people not having personal identity or people having boundaries. I thought that communism meant that the government was oppressive,” said Haye. 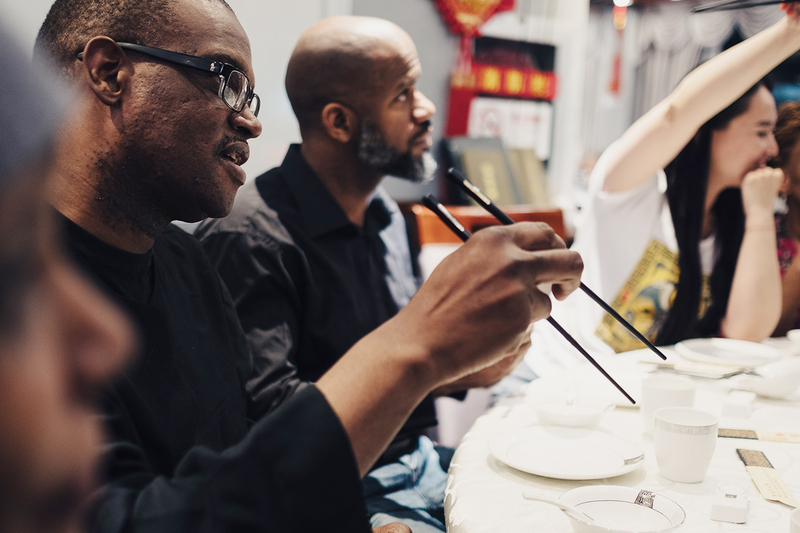 Pastor Frank Haye dines at a local restaurant, Shanghai, April 29, 2017. 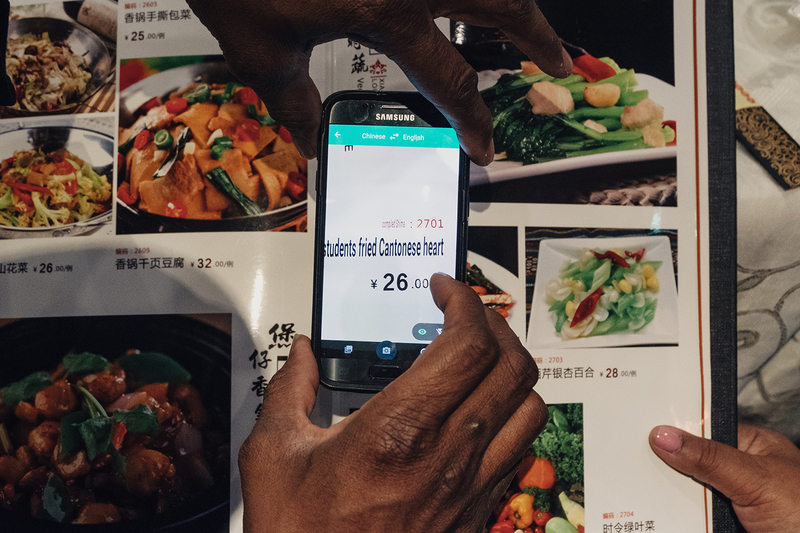 A choir member uses a translation app to help read a restaurant menu. Haye tried to remain open-minded as he prepared for the biggest concert of the tour at the Midi festival. He didn’t dwell on the pressures Christians in China can face, such as the recent forced closures and demolitions of churches in some southern provinces, or the crackdowns on Hong Kong pastors proselytizing in China. He focused on careful planning of his program—hymns for performance in church, popular music for the jazz clubs and rock venues. It was sound check time at Midi. The Brooklyn choir was slated to perform with the Keystone Gospel Choir, China’s first gospel group, established in 2011. Thirty members of the Keystone choir were trying to keep cool in a tent backstage, eagerly awaiting the arrival of the Brooklyn choir. When the American choir arrived, its singers broke out in broad smiles and waved before hustling on stage to warm up for their first joint rehearsal. That evening would be Keystone’s first performance with an American gospel group. Forty-five-year-old choir founder Huang Bo—a recovering rock musician who describes his pre-Christian self as a covetous sinner who lustily grabbed women as he pleased and carelessly hurt others—was in high spirits. Huang, also known for forming China’s first funk band, The Verse, in 2007, took his young choir to a Midi festival in 2016, but admitted they’d bombed. The microphones hadn’t been set up right, and his drumming and the electric guitar drowned out the choir. This time, he was determined to master the sound check. Singers from the Brooklyn Interdenominational Choir (left) and the Xiamen-based Keystone Gospel Choir (right) hug after a joint rehearsal in a hotel, Suzhou, May 1, 2017. The concert later that day was to include separate sets for the two choirs, followed by a joint performance. For Huang, the Midi concert was about much more than entertainment, and he wanted the audience to be clear about the Keystone singers’ call to faith. Getting a house or a car might bring happiness for a day or a month, but it doesn’t last, said Huang. China bans proselytizing in public spaces, but the rules didn’t worry Huang as he prepared for that evening’s performance. The quiet confidence often exuded by those who believe they are doing God’s work, however, didn’t spare Haye’s choir members from feeling anxious a few hours ahead of their rock festival debut, as they surveyed the sparsely populated grounds baking in the hot afternoon sun. They were about to step in front of an audience of rock fans that would be tough to engage anywhere. On previous days of the festival, electric guitar jams prompted the crowd to wave banners and crowd-surf. This afternoon, youth flashing body art and flying dreadlocks lounged at the festival’s on-site Beer Island bar. A few perused the paraphernalia on offer at stands nearby: t-shirts printed with a marijuana leaf motif, rub-on tattoos. Some festival-goers shared the choir’s uncertainty, and curiosity. The Keystone choir took to the stage first to warm up the crowd. Huang Bo launched their set with a song he wrote that was inspired both by the Book of Isaiah and Mel Gibson’s Hacksaw Ridge, the 2016 movie about a conscientious objector who opposes war on religious grounds. As the choir sang about the Lord giving strength to the weary, gigantic screens flanking the stage showed gory war scenes from the film, which features a pacifist Seventh-day Adventist who refuses to carry a rifle. Next up was the Brooklyn Interdenominational Choir. The Brooklyn Interdenominational Choir and the Keystone Gospel Choir perform ‘My Life Is in Your Hands.’ Video Courtesy of Tencent Video. Some closed their eyes and held their hands overhead, pointing skyward. Others formed hearts with their fingers. It started to drizzle, but nobody cared. “It was amazing,” Haye said later about the audience swaying to the music, a sea of disposable yellow and green plastic raincoats. “This is something that doesn’t even happen in New York,” where audiences would start leaving at the first sign of rain. A young couple in raincoats kissed in front of a reporter’s camera. A few in the audience started to cry. 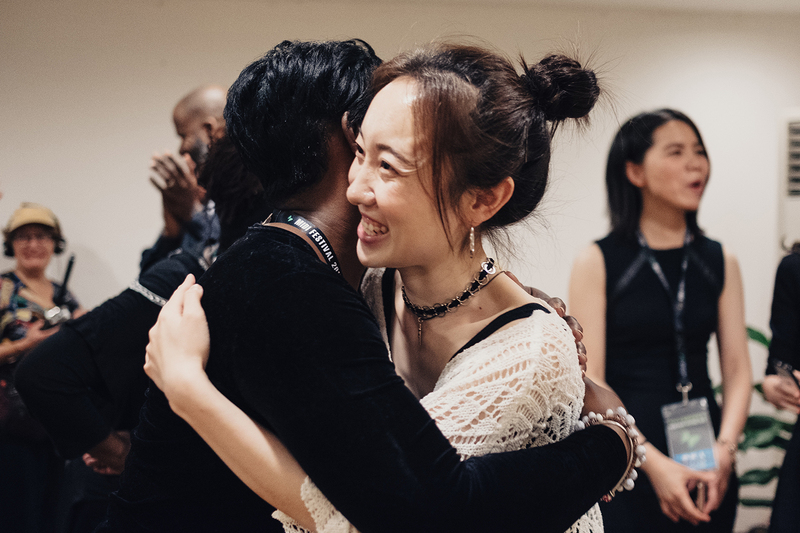 When the last song ended, a sobbing Chinese girl who called herself Hannah approached Brooklyn Interdenominational Choir soloist Karen Bernod, and asked for a hug. Then he, too, started crying, Bernod said. On the lawn in front of the stage, concertgoers talked about being moved in a way they had never felt when listening to rock music. “I felt very warm and comfortable, though I’m not interested in religion,” said a college student who offered up only one name, Xie. “Before this concert, I didn’t listen to this kind of music. But they make me feel warm. This music is more amazing than rock. It’s more impactful,” said college student Yu Xiaowu, adding that she listens to rock music when she’s depressed. On Christian music social media sites, the chatter was ecstatic. The clamor for more was palpable. “I want to create this kind of music festival to spread the gospel!” enthused a self-identified Christian sound-engineer writing under the handle black-black-small-white. For the Brooklyn choir, the best part of the trip came four days later in the seaside city of Xiamen. The Paul & Timothy Church, home to the Keystone choir, is on the third floor of a drab office building down a narrow side street. It’s easy to miss, but it’s home to one of the larger and most youthful of Xiamen’s 40-plus government-sanctioned congregations. The cavernous plain room with a simple wooden cross up front seats up to 500. Sunday services often attract 300. The two choirs were supposed to perform together in public in Xiamen, but at the last minute the government denied them permission. Choir conductor Huang Bo said police told him live music venues, theaters, and stadiums were being closed ahead of a high-profile political meeting in the city. It didn’t matter that the leaders of the BRICS group of emerging economies wouldn’t arrive until four months later. So the congregation hustled to refocus the concert as a recruiting opportunity, and held it as a private event in its own church. Members made donations and invited their friends. Paul & Timothy Church Pastor Lin Dong introduced the history of gospel music. It was sung by oppressed people seeking to feel joy and release in praising the Lord, he explained. Speaking with the vigor and enthusiasm of a Baptist preacher, Lin described the lack of trust and love in China today. After the performance, the Chinese pastor called on guests to approach the altar and pledge to join the church. About four dozen responded. They repeated a prayer of devotion, and Lin promised their lives would change for the better. They would enjoy the boundless love of Jesus and know a new inner peace, he said. When it was all over, the two choirs and churchgoers lingered for more hugs and photographs. As the tour wound down, Haye said the experience was a healthy reminder to challenge preconceptions. Professor Fredrik Fällman, an expert on Christianity in China at Sweden’s University of Gothenburg, cautions not to read the mostly unfettered tour as a relaxation of government restrictions on Christian outreach. “I would not be surprised if [the government] on another occasion stopped a performance on the grounds that it was too religious,” Fällman wrote in an email. Still, Haye expects the trip will not be his choir’s last collaboration with China. His dream is to bring the Keystone choir to Brooklyn. Haye says he’s talking with Brooklyn’s Borough Hall president to turn his dream into reality.